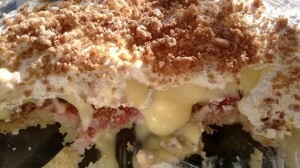 This is my homemade modern twist on a trifle recipe. It was quick (especially if you already have sponge to hand) and easy to make. I made my sponge fresh (as I didn’t have any in the cupboard) but you can always use any type of sponge cake that needs eating. Another good tip is to freeze any cake off-cuts. As usual with my blog recipes, I’ve included the cost of making this dessert, and have analysed the recipe – see the nutritional information below. I served this trifle in a glass serving dish, and I would say it made 8 generous portions. It was the perfect addition to our family BBQ at the weekend. This dessert is a medium fat and medium sugar dish. If you wish, you could decrease the sugar and fat further by using a granulated sweetener and Elmlea Light or a reduced fat double cream. To make the sponge, mix caster sugar, spread / butter, flour, egg and vanilla together with an electric mixer until smooth and pale. Divide into 6 muffin cases and cook in a pre-heated oven at 180 degrees C for approx 18 minutes. Cool. While cakes are cooking, chop up 100g of the strawberries and heat with a little water until bubbling and strawberries are soft. This is to spread on the cakes instead of jam – to make it a little healthier! Slice the cooled cakes into rounds and layer the base of a glass trifle dish. Add the cooled strawberry ‘jam’ on top of the sponge cake. Dribble 20ml of the amaretto liqueur over the cake / jam. Whip the double cream, then add the cream cheese, 2 teaspoons sugar and 5ml (teaspoon) of amaretto liqueur. Add this cream mixture on top of the custard. The total cost of ingredients were just under £5 – cheaper than a shop bought dessert, and far tastier and healtier! PS I shop at Lidl! This dessert contains 245kcal, 6g protein and 13g of fat per serving. This equates to 9g fat and 15g sugar per 100g (a medium fat and medium sugar dessert). The post Strawberry and Amaretto Trifle appeared first on Expert Dietitian.